Ensure your Skoda Kodiaq's exterior lights are fully functional at all times. The model-specific spare bulb set required to ensure that the vehicle has fully functional exterior lights is available from the ŠKODA Original Accessories range. The light bulbs included in the set are the same as the light bulbs fitted to the vehicle as standard. 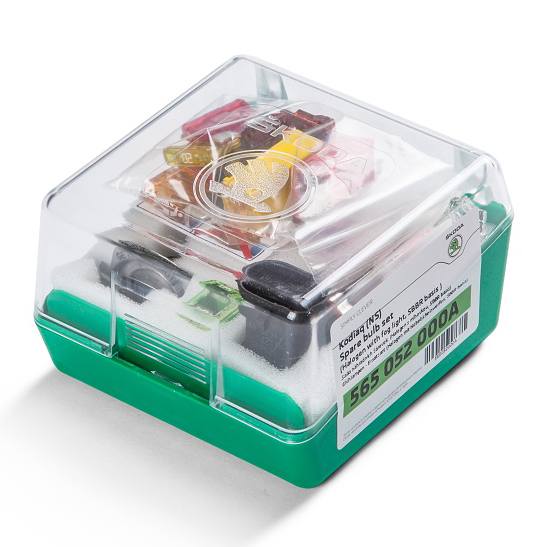 The light bulbs and fuses are stored in a lockable plastic case with the transparent lid, which can be stored in the toolbox in the vehicle‘s luggage compartment. When changing a light bulb, make sure that the bulb is sitting correctly in the fitting. For: Kodiaq (2017 onwards) – vehicles with halogen headlights and fog lights, SBBR basis.